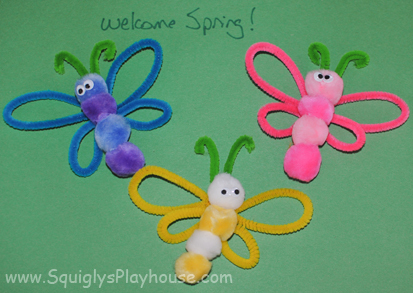 Make these fun and easy butterflies to celebrate the arrival of spring or summer. You will need pipe cleaners and pom poms to make this cool craft idea. Glue four pom-poms together. Allow to dry. While the pom-poms are drying, cut one pipe cleaner in half and bend each half to form the large part of each wing. Take the second pipe cleaner and cut it into thirds. Take two of the pieces you just cut and form each into the smaller part of each wing. Cut another pipe cleaner into quarters and take two pieces to form the antennae. Once the pom-poms are dry, glue two googly eyes on the top pom-pom. Allow to dry. Once the eyes have dried, flip the butterfly over and securely glue on the wings and antennae. See image at right for placement.